The point heater of our company is made by TURK+HILLNGER in German and it's conforms to the rail heating of all types and is set widely internationally. It can install the heater, which responds to the point of many point heaters. The voltage has 100 V type and 200 V type. We can stand the long years use of the corrosion-resistant characteristic stainless steel flat shape tubular heater. We can install at half of the cost of former models. About 10% consumption electric power decreases compare to former models. 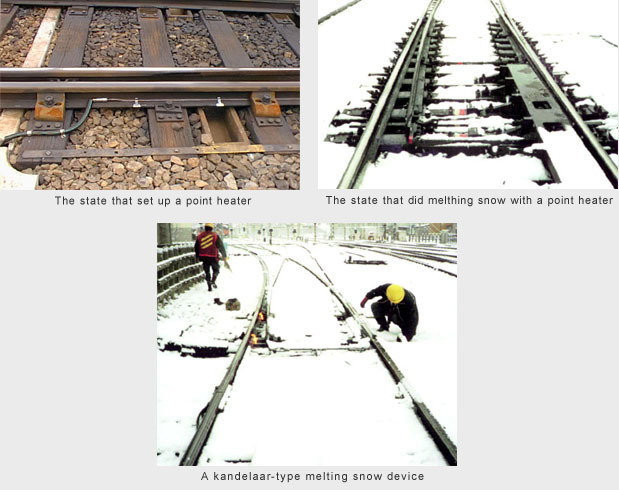 Since a point heater is attached to a basic rail, the rise in heat of a rail can melt snow quickly early. It's easy, quick and low cost because、it sets、to the abdomenof basic railwith installation metal fitting.